"After His resurrection, Jesus gave His disciples a mission: to go to all the nations and make disciples, baptising and teaching them. That remains the continuing mission of the church today. In this book, Dr. R.C. Sproul explores the Great Commission by laying out the biblical basis for missions, defining the gospel and evangelism, and addressing the need to mobilise Christian believers for missions. He also touches on methods of evangelism, while pointing ultimately to the One who promised that He would build His church. This book is a challenge to the church and to individual Christians to obey Jesus' command to go and make disciples." What Is The Great Commission? by Sproul, R. C. was published by Reformation Trust in June 2016 and is our 30817th best seller. The ISBN for What Is The Great Commission? is 9781567694987. 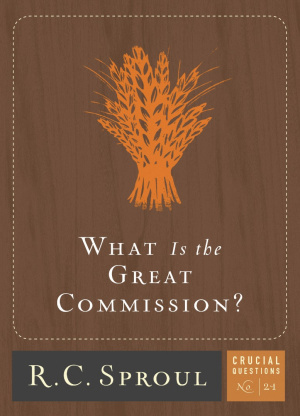 Reviews of What Is The Great Commission? Be the first to review What Is The Great Commission?! Got a question? No problem! Just click here to ask us about What Is The Great Commission?. Details for What Is The Great Commission?